Bounce House & Party Rentals | AZJollyJUmpers.com Phoenix AZ. Thank you for visiting AZJollyJumpers.com; your best choice for quality bounce houses, water slides, inflatable games, concessions machines and so much more! All of our rental equiptment is cleaned and sanitized after each use, and our inflatables are updated every two years to ensure every bounce house or slide is shinny and eye catching. AZjollyjumpers.com is fully lisenced and insured and our insurace documents are onfile with local parks and recreation offices. We have the largest selection of inflatable themes with over 60 to choose from. AZ Jolly Jumpers is your one stop shop for all your party rental needs! From Joust arenas, obstacle courses, fall themed inflatables, corporate parties, and more. Reservations are quick and easy can be done online 24/7 or with one of our friendly event coordinating staff. We can create a package with your needs whether a large public event or intimate backyard gathering. 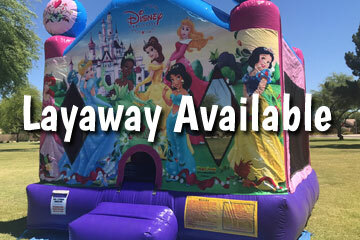 We offer a wide variety of inflatables, staffing mechanical rides, yard games, seating, linens, tents and more. At AZJollyJumpers.com we proudly support our local schools, churches and active service members. If you are responsible for organizing your group's event, give us a call and let us provide you with the experience and resources you'll need. We will also create your event package at a price that meets your budget. 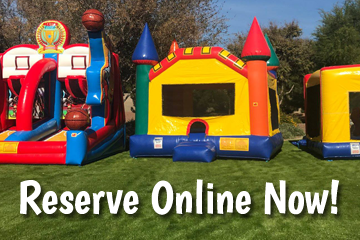 Making your party and event reservations at AZJollyJumpers.com is fast and easy with our new online reservations system. Just click the link below and enter the date and times of your event. Then as you browse through the website you will be presented with only those items available on your date. You can also just explore all the categories and as you see items that are perfect for your party, just click the "Add to Cart" button on every product page, and build your party that way. That's it! It's easy as one, two, three! Let's get your party started now! We can set up a weekly, biweekly or monthly payment to be automatically debited from your debit or credit card until the balance of your event is paid. Give us a call to discuss options. AZ Jolly Jumpers Party Rentals offers discount water slide rentals, bounce house rentals, slip n slide rentals, table and chair rentals, in Phoenix, Glendale, Peoria, Surprise, Anthem, Avondale, Tolleson, Paridise Valley, New River, Laveen, Scottsdale, Litchfield Park, Good Year, Tempe, Fort McDowell, and El Mirage.